When it comes to shopping and prep, there are a few things we can do to make shopping and prepping food a bit easier on ourselves so we don’t get overwhelmed during the week. 1. Make a list of your favourite meals. What meals do you and/or your family love? What do they complain the least about? What have you made that they like to eat? Make sure that at least 1 or 2 of those meals is on your weekly meal rotation. For example: My kids love pasta. My husband and I don’t love it as much as we used to so we compromise and serve it once a week or once every two weeks and we always have a side salad or a side of vegetables. That way everyone is happy, no one is complaining and making pasta is pretty fast and simple for everyone. 2. Make your favourite, but simple, meals on your busy nights. If you know that your daughter has basketball at 6 don’t try to make a gourmet meal that night. Eat the pasta. Make eggs and sourdough toast with avocado. Keep it simple, but nourishing so that everyone is getting the nutrition they need, but that is fast and simple for whoever is cooking the meal. 3. Make a grocery list (and check your cupboards before you go to the store to make sure you don’t already have an item on the list!). I’ve said it before and I’ll say it again: making a grocery list is the single most important task you can do to make grocery shopping easier and efficient. So many times I see people in the store, mulling about, leaning on their carts trying to decide what to eat. 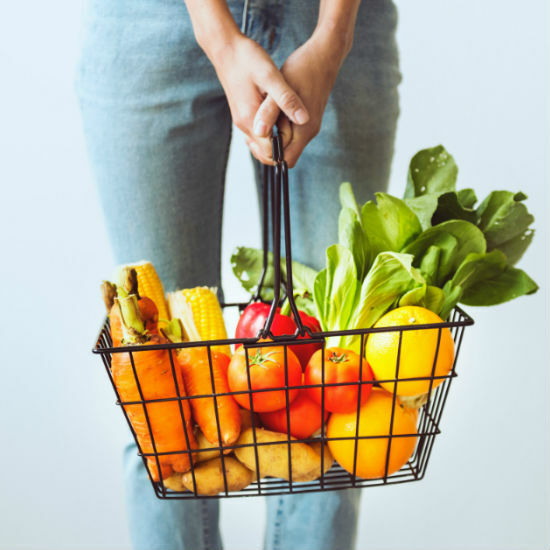 Those are the times you’re likely to buy too much food or go to those dreaded middle aisles for the packaged frozen food that isn’t giving your body the nutrition it needs to be well. Plus it’s a waste of time–extra time that you likely don’t have to waste. Make a list. Go into the store and get out as fast as you can. 4. If you don’t have time to shop, order groceries for delivery or pick up. Many people I know just don’t have time to shop on the weekends because they pack their days with kids’ activities and other events. Don’t feel you need to spend an hour at the grocery store. Take advantage of services like Click and Collect at Loblaws or grocery delivery from Grocery Gateway, Walmart (I think Walmart has grocery delivery now?) or choose an organic food delivery like Fresh City Farms which has loads of other items beyond produce. These groceries will get delivered to your door so you don’t have to spend time going to the store for long periods of time. Fresh City Farms even has high quality meats and fish, pantry items like tea and coffee, local sourdough bread and high-quality snacks, as well as prepared salads, smoothies and juices. 5. Don’t be afraid of short cuts. There is absolutely nothing wrong with frozen fruit and veggies. They might change the texture slightly to some of your meals, but they are picked and frozen at peak freshness so you can be assured that you’re always getting great food. Using frozen cauliflower and broccoli in a stir fry can save a ton of time so use them! When it comes to salads, try those kale bagged salad mixes if you’re in a rush (just ditch those dressings! They’re full of added sugars, oils and icky ingredients) and make a simple olive oil and vinegar dressing. The only thing I would caution against is using fresh cut up fruits and veggies. Once a fruit or veggie is cut, it can be a lot easier to be contaminated at the store so please keep that in mind when buying prepped food from a grocery store. 6. Make time to prep, even if it’s just a little. I highly encourage people to prep, even if just a little bit when get home from the store. Wash and store greens like lettuce, spinach, kale etc. First, it will last longer and second, when you need it you can just use it–you don’t have to spend time washing it later. Cut up veggies like carrots and celery so you can munch on them or just have them ready for your meal during the week. Roast any hearty veggies that are on your plan for the week. Veggies like potatoes, sweet potatoes, turnip, and squash can all be roasted ahead of time and used later on. Make use of a BBQ or oven that is already in use! If you’re roasting veggies for dinner, bake an oatmeal dish for breakfast at the same time or when the veggies are finished. It will last all week for breakfast. BBQ extra chicken for lunch salads during the week. Boiled eggs last all week so on Sunday, boil a dozen eggs to grab and go. 7. Write down your meals for the week. Believe me even I sometimes forget what I had planned for a particular night for dinner but as soon as I look at my list I know what I’m having. Don’t stare into the fridge and wonder what you bought the chicken for. Make a meal list so you always know what you’re having or if you have to switch something around it’s easier to do that with a list. 8. Don’t be afraid of leftovers. I love leftovers for breakfast and lunch, but why not eat them for dinner too? Make a big batch of chilli to serve in a bowl one night and as a burrito or taco bowl the next night. Chicken can be eaten up the second and third day in tacos, wraps or simply sliced on a salad. Cook food once and use several ways. I hope this helps you a bit with shopping and prepping for the week. If you have other ideas I’d love to hear them! Let me know in the comments below.